Edvard Grieg (1843--1907) is best known for his eternally popular Piano Concerto in A Minor, as well as more than 150 songs and 66 lyric pieces. March of the Trolls is from his Lyric Pieces, Op. 54. Trolls are a constant theme in Norwegian folklore and can be viewed as the equivalent of our "boogie man." Far to the north in Norway where the winter storms whip the weather-beaten coasts, you will find dark forests with moonlit lakes, deep fjords surrounded by mighty snowcapped mountains, and long rivers and cold streams cascading down the mountain sides. This is where you might find the irritable, short-tempered trolls coming out of their hiding places after sunset, marching to wreck havoc on unsuspecting Norwegian households. 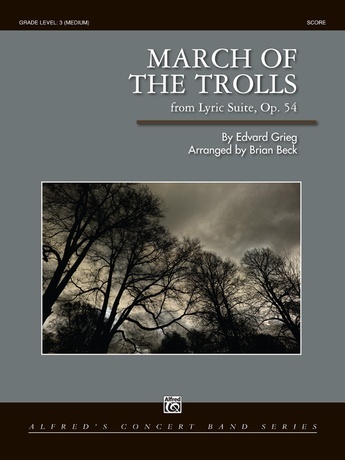 Wait and see what your audience will do when the Trolls march up and down the aisles of your next concert! This title is available in SmartMusic.